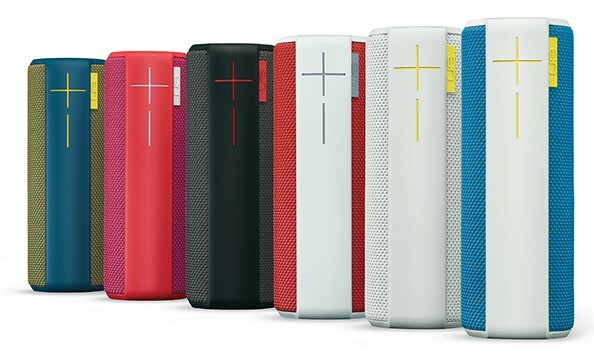 UE BOOM is the first-ever social music player, a wireless speaker that’s packed with a specific set of features that sets a new standard for listening to music. It’s the first stereo speaker to offer 360-degree sound in a battery-powered device, and features a 15-hour rechargeable battery. Its versatile go-anywhere shape is wrapped in a specially developed acoustic skin that is both water and stain resistant so you can enjoy your music anywhere you go. And it is made for connecting with others. If more friends crash the party, you can wirelessly connect two UE BOOMs together through the free UE BOOM app (available for iOS and Android) to play them in either stereo-to-stereo mode or traditional left/right stereo mode. The wireless speaker also comes with a Double Up feature to make it even easier to connect two UE BOOMs together for bigger sound, or traditional left/right stereo sound. Once you sync two UE BOOMs together for the first time, they will remember each other and automatically Double Up the next time both speakers are powered on. This means the party will stay extra-loud, and you can stay focused on your friends and the music, not the details of pairing up! One can also custom-tune their UE BOOM using the five-band equalizer in the free UE BOOM App to tweak the mids, highs and lows, and the speaker will remember it. UE BOOM is available in India at a price of Rs 14,995 and is available in UE Boom Orchid, UE Boom Superhero, UE Boom Black, UE Boom Aqua colors.